West Coast Sea Glass will be at this colorful weekend event filled with over 60 booths filled with the very best beach glass and coastal arts from around the country. Held at the Bayfront Convention Center in Erie, Pennsylvania, doors open Saturday at 10am and close Sunday at 5pm. More info. This beautiful, outdoor venue is expected to have over 5,000 visitors. Dozens of vendors and handmade coastal art will line Bridge Street in the historic Ashtabula Harbor. Saturday and Sunday 10am - 5pm. More info. The only one of its kind in Canada, this festival is held on the 4th weekend of July annually. It celebrates sea glass, aka Mermaid Tears. The festival is held in the scenic community of Souris in Eastern Prince Edward Island. Things start on Friday evening with a lecture by a guest speaker then things continue through Sat. and Sun with a vendor fair of crafts as well as many other activities for the whole family. More info. This high energy, two-day event is filled with exhibits, vendors, lectures and the Shard Of The Year Contest. 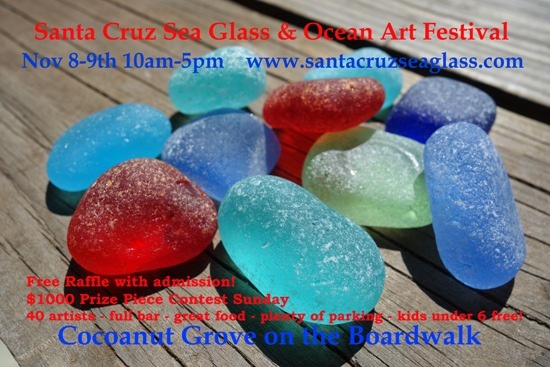 West Coast Sea Glass will be there vending our finest, hand made jewelry created with historic, Pacific Ocean seaglass. We will be selling beautiful lots and batches of high quality loose, bulk sea glass. The Sea Glass Festival is an international event sponsored annually by the North American Sea Glass Association. NASGA is a non-profit organization dedicated to the worldwide sea glass collecting community. It will be held in Cape May, New Jersey this year. More info. Meet author of the new book, The Ultimate Guide to Sea Glass, Mary Beth Beuke. She will have the book at the West Coast Sea Glass booth #210 and will be personally signing copies! This popular, 272 page book with over 150 color photos has been getting 5 star reviews and has been on the best seller lists for the past 4 months! Author, West Coast Sea Glass owner, artist and lifelong collector Mary Beth Beuke will help answer sea glass and beach combing questions at the North American Sea Glass Festival in Cape May, New Jersey, in the Convention Center - Sat. Sept. 27th, 1pm. More info. This colorful and beautiful California event is going strong on the West Coast. Join hundreds of true sea glass fanatics for two days; Nov. 8-9th, 2015 at the Cocoanut Grove venue in lively Santa Cruz, CA boardwalk. Admission $5 daily, 10% of which will be donated to the Monterey Bay National Marine Sanctuary! The Prize Piece Contest happens Sunday.